Photoshop Contest: What Is VR Guy Experiencing? With an expressionless face and a twitch of his head, VR Guy peered awkwardly into our souls when he bravely decided to break out his Samsung Gear VR on the subway. But the question remains: What exactly does VR Guy see that we cannot? We must turn the question over to you, readers. What makes him appear to look down? What makes him turn, so violently, to the left? 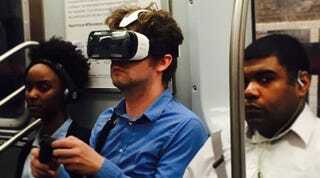 If you were VR Guy and you were having a VR experience on the New York City public transit, what would it be? Someone asked if the image might be what reality VR Guy was missing by being so immersed in his VR. That could be one way to interpret it; I leave this up to you. The lovely jimthebrit envisions a sort of Corona ad-esque beach where VR Guy was juuuuust about to sip a virtual Mai Tai—until he had to get off at Union Square. Here’s the original story for background. Upload your submission as a comment in this post by Monday’s evening rush hour and please make VR guy proud. Update: He’s a real person!